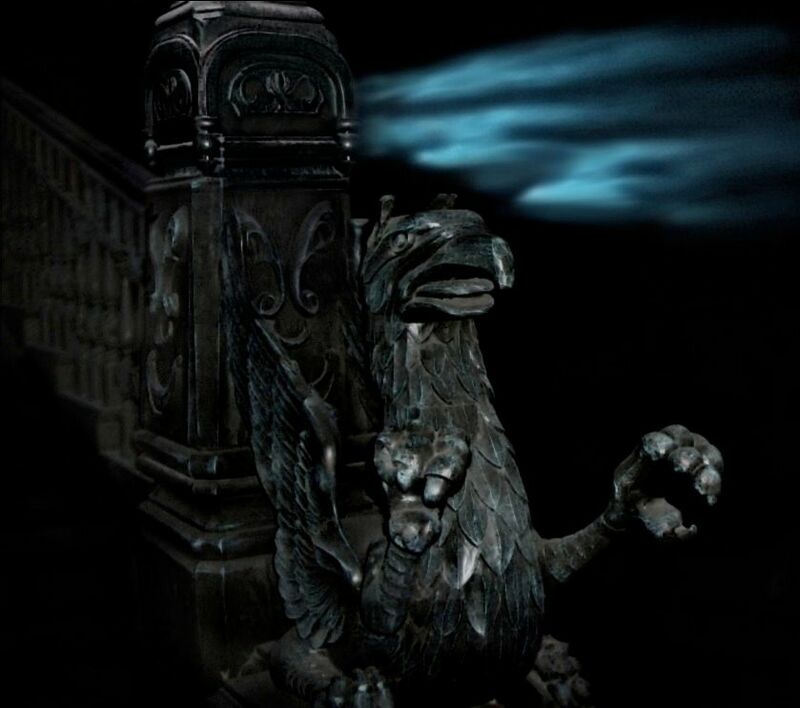 A few posts back we discussed the gryphons at the foot of the stairs. I said that they were like sentinels at the gateway to the unknown, "and that sort of thing." Well, today we plunge headlong into "that sort of thing." 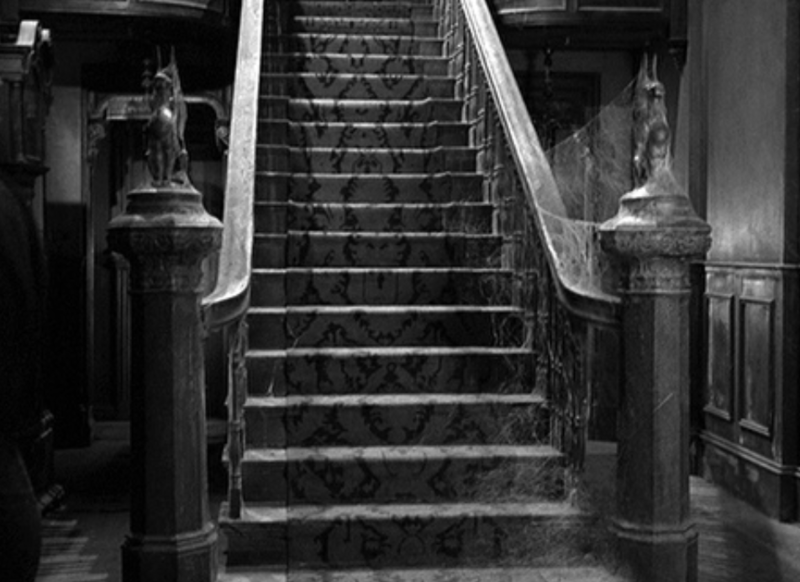 We've been schlepping around in the 19th and early 20th centuries looking for things that might have inspired the Imagineers. In this case, however, they are probably not taking inspiration from some specific source so much as they are making use of symbolism that must be measured by millenia rather than a few paltry centuries. But there's a lot of slop in those terms, even among scholars and archaeologists. Most of the time, for all practical purposes, they're more or less the same creature. Interestingly, some linguists think "gryphon" is derived from "cherubim" (which is the normal Hebrew masculine plural form of "cherub"; it's one cherub, two cherubim). Those are all plausible consonantal transmutations when a word travels from one language to another. Now pardon me for a moment while I get this out of my system. How these pudgy little atrocities picked up the name "cherub" is beyond me. Gag. Wretch. Drat, there's never a neutron bomb around when you really need one, is there? These pests are found in Western art only. Eastern Christian cherubim remain properly terrifying. Okay, I feel better. Now back to cherubic thrones. Those hail from the Ancient Near East, and "ancient" is what they certainly are. 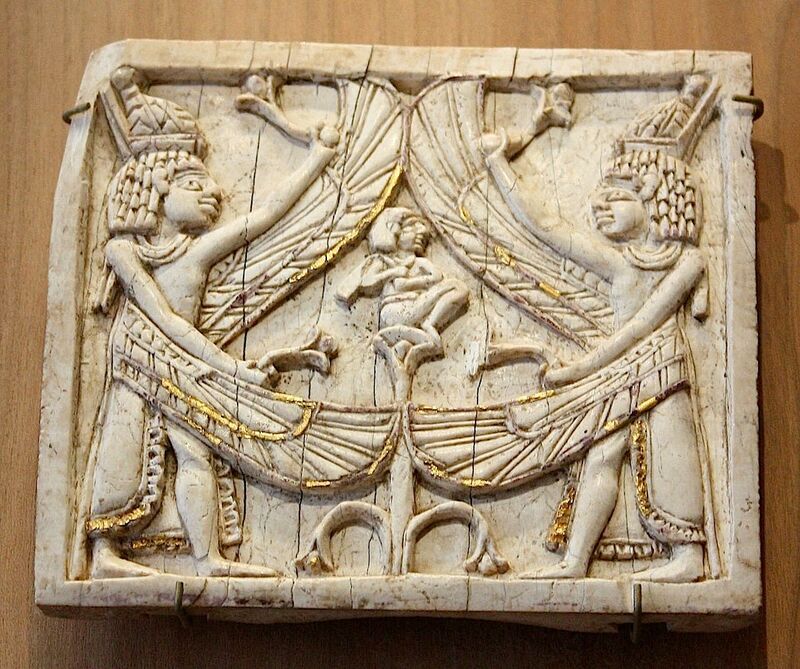 Here's an ivory from Megiddo, ca. 1250 BC, give or take a century. From the sarcophagus of Hiram, king of Tyre, ca. 1000 BC. It's not rocket science. The animals represent gods, and they are guarding the king, who is practically on a par with the gods themselves. The king is seated upon the cherubim, which may ring a bell with the biblically literate among you, since God is seven times described as seated upon the cherubim (1 Sam 4:4; 2 Sam 6:2; 2 Kgs 19:15; 1 Chr 13:6; Pss 80:1; 99:1; Isa 37:16). It's very much a royal image. 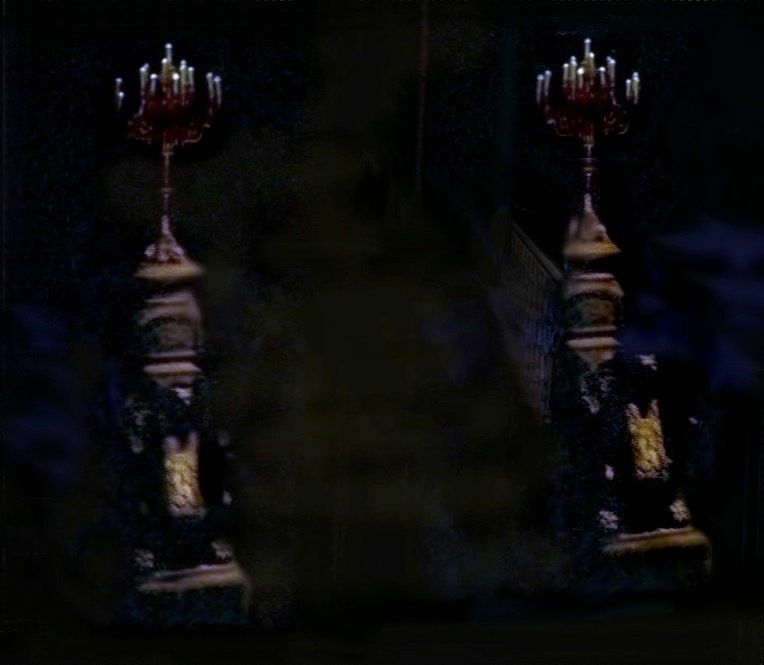 In the Holy of Holies in Solomon's Temple in Jerusalem, there were two HUGE cherubim, with the Ark of the Covenant between them and in front of them. (The Ark also had a small pair of them on its cover, as any Indiana Jones fan can tell you.) God cannot be seen, but he was apparently understood to be seated upon the cherubim, and the Ark was his footstool (footstool?!? yes, footstool; see Ps 132:6-7; 1 Chr 28:2). The high priest entered and stood before the Ark, in the actual presence of God, once a year, in pitch darkness, protected only by a heavy cloud of incense smoke. He had bells on the fringe of his robe so they could hear if he was still moving around; that is, had not DIED. 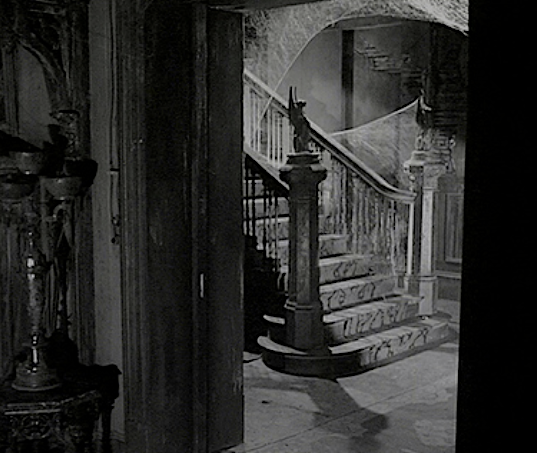 In later times they tied a rope around his ankle so they could drag out the corpse if something went awry. 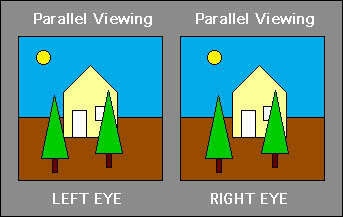 Powerful images, and part of our psychic inheritance, whether you're a believer or not. Sometimes the cherubim are gryphons, in line with the fluid interchangeability of these creatures. 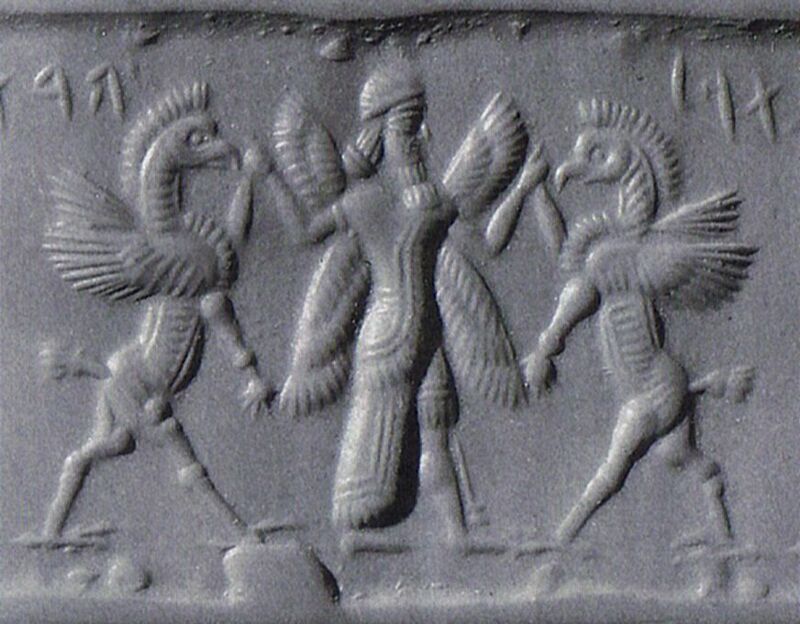 Here's a good example from an Assyrian cylinder seal, ca 700 BC. Two gryphons flanking a god. And we still use them in royal or supernatural settings. 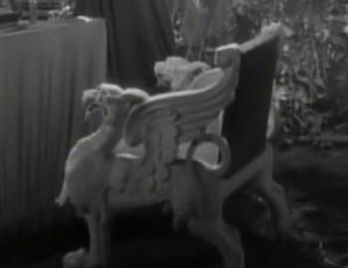 If you've got sharp eyes, you'll spy such a chair in Cocteau's La belle et la bête (1946), a film that profoundly influenced Rolly Crump, as many of you know. It's no surprise that Caesar is sitting on a chair of this type, as we have seen before. He is, after all, Caesar. But thrones aren't the only option for cherubic pairs. 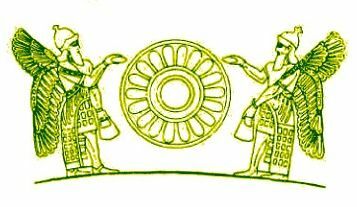 In the iconography of the Ancient Near East they may simply stand on either side of a god or a king—in these two examples a sun god and a prince. 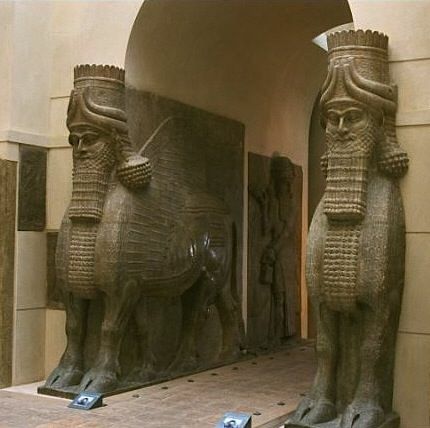 They can also stand like sentinels at the gateway leading to the royal presence, as in this Assyrian example. (For their cherubim, the Assyrians preferred a bull's body to a lion's. Regional variations, blah blah blah.) These have now been destroyed by ISIS. And with that one, the symbolism approaches our home base. And...so what? I'm just pointing out that in some places the HM traffics in cultural symbols with astonishingly long pedigrees, and that longevity owes something to the power of those symbols to evoke even today a sense of the supernatural, a sense of fear and awe. Thanks (I think). 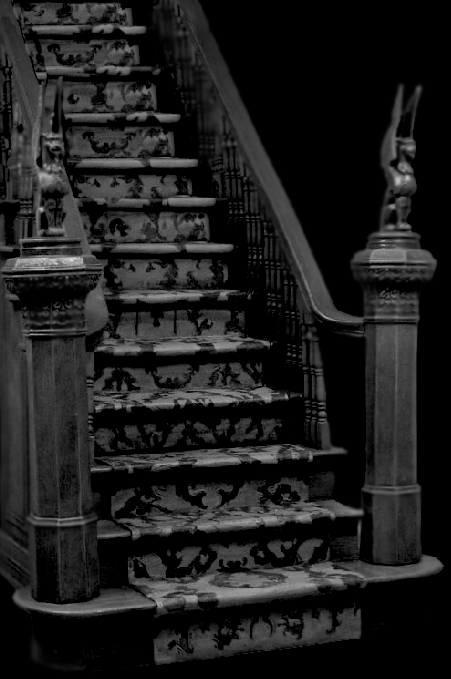 It's only a matter of time before someone pulls a PhD out of the Mansion. I just hope they spell my name right in the footnotes! http://www.catholic-pages.com/bvm/hahn.asp The cherubim throne was for the Queen Mother in m\Middle-east cultures. I think that article is incorrect in describing the Ark of the Covenant as an empty cherubic throne. 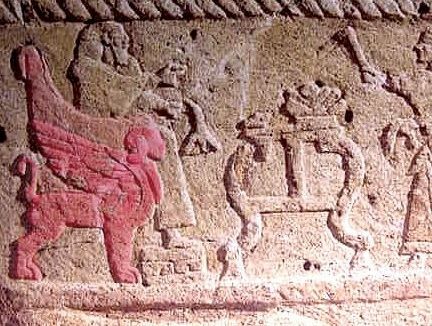 The Ark was the footstool of the throne thought to be above it, invisibly occupied by the God of Israel. In the Jerusalem Temple two huge cherubim did in fact stand on either side and probably slightly behind the Ark, representing the throne. 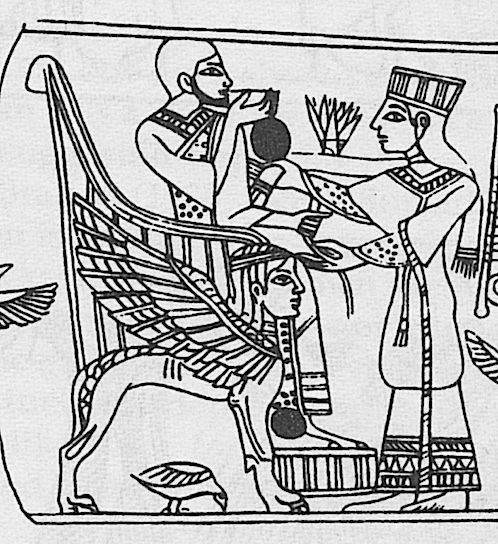 In Egypt, the royal footstool or the footstool for a seated idol was sometimes a chest containing covenantal documents, and sometimes these were thought to have been written by the god himself. Both of these motifs also correspond to the Ark of the Covenant as God's footstool. 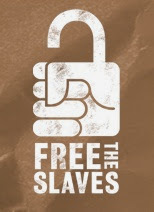 Their symbolism is however that of protection and they evolve in many ways in many different cultures. Argument can even be made that the individual animals that make up their components evolved into the symbols of Mathew Mark Luke and John: a Man, a Lion, an Ox/bull and an Eagle. Yes, "Lamassu" was the name of the protective deity in Assyria. It had a bull's body instead of a lion's, but it was clearly Assyria's version of the same old deity found throughout the Ancient Near East, and yes, certainly, this predates Judaism. "Cherub" was the Hebrew name for what the Assyrians called Lamassu. Interestingly, the Assyrians had another name for Lamassu, "Shedu," and that name came directly into Hebrew as Shed. It became the common, everyday Hebrew word for "demon." You keep referring to the girl being celebrated as the birthday girl. Since it's the HM, I'm pretty sure it's actually a "death day" party. It's referred to as both a deathday party and a birthday party in official and semi-official sources, but usually the latter. 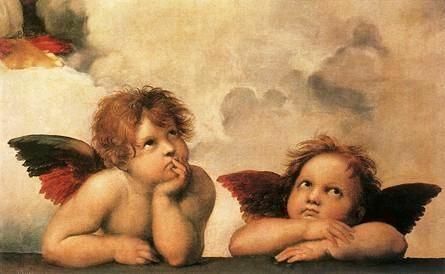 Little chubby baby angels in art are properly called "putti" (singular: putto). I'm not sure how they came to be called cherubs at all; they basically started off as a rococo flourish adapting little imps and godlings in pagan mythological art to a Christian context. Silly putti, if you ask me (and I know you didn't). Um, I've never seen "cabbage" listed as a possible meaning in any lexicon, and the kind of supernatural being it refers to is not what most people would consider an "angel." Maybe those are ways "cherub" is used as a slang term in modern Hebrew. They're definitely not what the word means in the Bible.